Christina joined us in Summer 2007. After studying the VN course she successfully qualified as a fully trained nurse in June 2010. Christina has become a Senior Nurse and shares responsibility for the Nurse Clinics, Nurse Training and Puppy Parties. She also co-ordinates the all important ordering of medicines and supplies. She has a cat called Misty who was one of three tiny kittens found abandoned and brought to Barton Lodge. 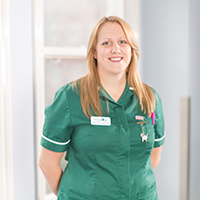 Christina is very fond of cats and in 2017 gained her ISFM Certificate in Feline Nursing, which has expanded her knowledge of cat health, welfare and behaviour.